After a fantastic debut year at its new location of Gunnersbury Park, Lovebox returns this year with an incredible line-up for 2019. 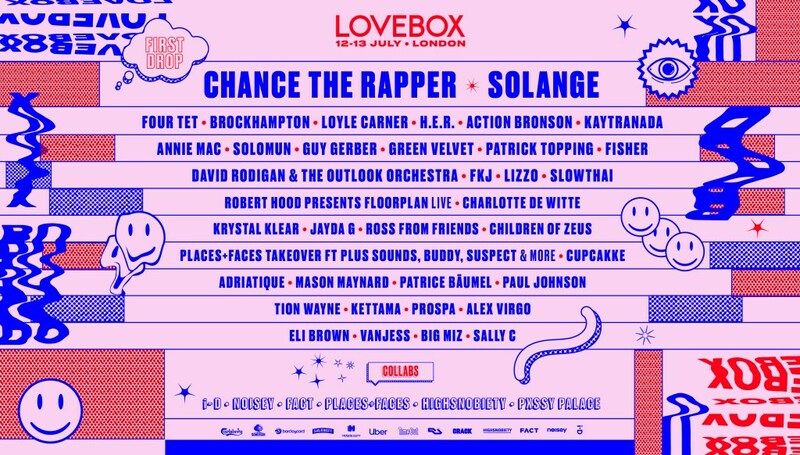 Lovebox 2019 will see sets and performances from an array of internationally-acclaimed heavyweights including singer, songwriter and visual artist Solange, who will be headlining the Main Stage on Friday night, and Chicago’s very own Chance The Rapper, taking the top spot on the Main Stage on Saturday. Special appearances from the likes of Four Tet, BROCKHAMPTON (UK EXCLUSIVE), Loyle Carner, H.E.R. (UK EXCLUSIVE), Action Bronson and Kaytranada will ensure that this year’s edition will be one of its most vibrant to date. On Friday night, Lovebox will welcome back the globally celebrated American artist Solange, two years on from her epic performance on the Noisey Stage, where it was reported that she ‘broke free from the hospital’ to perform an unforgettable headline set. Following the release of her debut record ‘A Seat At The Table’, which went to number one on the US Billboard Charts. In the wake of this seminal album, came performance art shows at the Guggenheim Museum, the Chinati Foundation in Marfa and London’s Tate Modern. At the end of 2018 Solange revealed that new music was on its way, making this sure to be one of the most hotly anticipated performances in London this summer. The second headliner announced today is multi-disciplined, three-time Grammy Award-winning artist Chance The Rapper, who will be closing the Main Stage on Saturday night. The American artist first gained recognition after the release of his 2013 mixtape ‘Acid Rap’ and went on to become a significant contributor to Kanye West’s ‘Life of Pablo’ before releasing his third mixtape ‘Colouring Book’. Most recently, the end of last year saw two surprise releases from him, including ‘The Man Who Has Everything’ and ‘My Own Thing’, hinting at new material to come this year. Lovebox will continue to bring some of the biggest names in dance music to London this year, with sets from Four Tet and Canadian hit-maker Kaytranada. Over the years, Four Tet has become legendary on the global dance music scene, with fearless and forward thinking sets at his sold out ‘All-nighters’ at Brixton Academy as well as beautifully crafted live shows which Mixmag have deemed as ‘the best live show we’ve ever seen’. Kaytranada has remixed everyone from Danny Brown to TLC right through to emerging R&B stars such as Nao and Kelela, He closed 2018 with a return to major-label RCA releasing the 3-track EP ‘Nothin like U’ / ‘Chances’. Lovebox are also thrilled to have contemporary R&B artist H.E.R. (UK EXCLUSIVE), who has been championed by major artists including Janet Jackson, Alicia Keys and Rihanna. The enigmatic singer and multi-instrumentalist has quickly become one to watch and was nominated for five Grammy awards at the end of last year, and was awarded two at the official ceremony earlier this week (Best R&B Album, Best R&B Performance). Another stand-out act to join the line-up today is American hip-hop collective BROCKHAMPTON (UK EXCLUSIVE). The group received global attention after the release of their third studio album ‘Iridescence’, which debuted at number one on the Billboard 200 album chart. In its review of BROCKHAMPTON’s sold-out performance at London’s KOKO last year, DIY magazine deemed them as ‘the most exciting group on the planet’. American rapper, television personality and author Action Bronson will bring his signature personality and hip-hop style to Lovebox this year. Although over the years Action Bronson has become a celebrated food-enthusiast and TV personality, with his own talk show ‘The Untitled Action Bronson Show’ and food channel with Viceland, he has also established himself as a key player in the global hip-hop scene. The two time BET Award-nominated artist has released five studio albums, collaborating with legendary acts and producers including the likes of Ghostface Killa, The Alchemist, Raekwon, Wiz Khalifa and more. 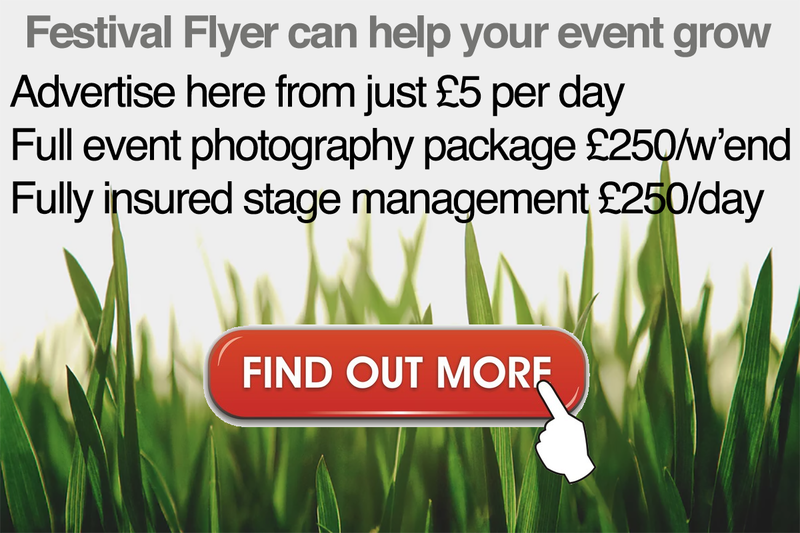 Lovebox will showcase the best of Britain’s home-grown talent this year, with a performance from British hip-hop artist Loyle Carner, who first rose to prominence after the release of his debut album ‘Yesterday’s Gone’ in 2017, which received highly-coveted nominations from the Mercury Prize and the BRIT Awards (Best Male, Best Newcomer). Gracing the decks this year at Lovebox are festival-favourite Annie Mac, award-winning Israili DJ and producer Guy Gerber, experimental, funk-influenced artist and producer Green Velvet and Patrick Topping – one of the most in-demand names in dance music right now. Lovebox will also welcome American minimal-techno legend Robert Hood and highly-sought after Belgian DJ Charlotte De Witte to the stage this year. Elsewhere, the legendary David Rodigan performing with The Outlook Orchestra having just recently sold out the Royal Albert Hall, and Australian tech-house producer Fisher will be playing sure to be memorable sets. Another exciting British talent to take the stage this year will be Northampton-native rapper slowthai, who has gained buzz around the country largely due to his exhilarating sweat-fuelled live shows, typically ending with him wearing nothing but his underwear… slowthai was included on BBC’s ‘Sound of 2019’ poll as well as Vevo DSCVR’s ‘Ones to Watch 2019’. Also announced today is American rapper and singer Lizzo, who will bring her exhilarating and refreshing live show to Friday’s proceedings. Following her highly-successful track ‘Juice’, released earlier this year, Lizzo is set to release her third studio album ‘Cuz I Love You’ in April. Other performers announced today include French multi-instrumentalist and singer FKJ, who will bring his mellow, electronic sounds to the festival on Friday and hotly-tipped English producer Ross from Friends. As well as rising Manchester-based duo Children of Zeus, Krystal Klear, and Jayda G.
Lovebox are excited to announce that fashion and art collective Places+Faces will be hosting a P+F Sounds take-over with a host of sensational talent including London-based MC Suspect, who gained wide-spread attention after releasing his 2018 album ‘Still Loading’ and American rapper, singer and dancer Buddy, who has collaborated with the likes of Snoop Dogg and A$AP Ferg. Other acts not to be missed at this year’s festival include American rapper and hip-hop artist Cupcakke, celebrated for her unapologetically honest lyrics and videos, Swiss electronic duo Adriatique, hotly-tipped Manchester native Mason Maynard, German techno-producer Patrice Bäumel and American house-producer Paul Johnson. Lovebox will also champion an array of rising electronic music artists including up and coming acts such as Kettama, Prospa, Alex Virgo, and a B2B set from Big Miz & Sally C.
Further talent comes in the form of North London grime artist Tion Wayne, Bristolian house producer Eli Brown and sister-act VanJess. Lovebox are delighted to announce a host of outstanding media partners including i-D, Noisey, Highsnobiety, Places+Faces and FACT – all hosting areas and takeovers at this year’s festival. 2019 will also see the return of Pxssy Palace, who will be hosting The Sanctuary – a safe space dedicated to the inclusivity of Womxn and LGBTQI+POC. #Lovebox19 has loaded and there is still more to come – this is set to be yet another unforgettable year as London’s most loved festival.